Rose is the daughter of a rich gentleman. Michael is the son of a rich family. And Alex is the illegitimate son of a harlot. An interesting love triangle to say the least. 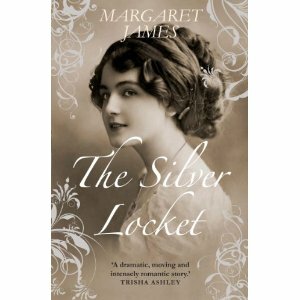 Now add in World War I, Jane Austen like arranged marriages, and a lot of strange characters and you have The Silver Locket. Rose's family wants her to marry Michael, a handsome man who is a good match, but Rose wants to do something else with her life. So she runs away, lies to become a military nurse, and meets all sorts of characters while finding her true place in life. Alex joins the army to forget about Rose, the girl he's loved from afar since he was 12. And in forgetting about Rose, he distracts himself with another woman Chloe who he eventually marries out of obligation, not love. And Michael joins the army out of obligation, hates Alex, and continually tries to convince Rose to marry him to gain her father's inheritance. I'm not going to give away anything else but will say that as much as I wanted to, I didn't really like this book. I finished it because I have a habit of finishing books and I had to for the purpose of this review. But there wasn't a single character that I actually liked other than maybe Maria who was only in about 5% of the book. I felt like they all had major flaws that were infuriating to me, and they all criticized and judged each other when they were doing the same things, just in a different form. One example that killed me was that Rose thought Michael was a terrible person because he abandoned his own child, but Alex abandoned his wife and child but she didn't seem to care. I did however, like the fact that Rose broke from the mold of her society and ran away to do her own thing rather than being forced into a marriage she didn't want. I also felt like the story just kept dragging on and on without any new developments. The same story that started in England moved to France and then to Russia. Rose worked a nurse, Alex and Michael fought, and they all worried about each other getting hurt. And it just kept going when in reality the same storyline could have been played out in half the pages. This book may be for some people but it wasn't for me. 2 stars. Thanks for joining our discussion of this book! Want a book or product reviewed? Contact us and we'll try and match you up with one of our great reviewers. Blog Design by Crafty Hippo Designs.